Confortablement aménagée, entièrement climatisée et dotée de 2 chambres / 1 salle de bain en étage élevé, Isla Bella peut accueillir confortablement 4 à 6 personnes. Obtenez une vue directe sur la plage depuis chaque chambre! Moins de 10 minutes de l'aéroport, vous pouvez être dans l'océan moins de 30 minutes après l'atterrissage. Marchez du hall jusqu’à la plage en 50 marches! Une piscine pleine d'eau douce de 25 mètres est encore plus proche. Le bâtiment a la sécurité 24/7. REMARQUE: lorsque vous réservez sur HomeAway, des frais de location et de nettoyage vous seront facturés. La taxe de séjour de 7% et le dépôt de garantie seront facturés séparément et sont payables 60 jours avant la date d'arrivée. Les détails sont dans le contrat de location. We couldn't have found a better place than this for our vacation. Direct view of ocean from the balcony were amazing. We sat in balcony for hours soaking in the view. Communication was made super easy. They were in constant touch until we reached San Juan and instructions were very clear. Management left us with Groceries needed(bread, cheese, eggs, milk, PB etc) needed was couple of days. That's a Bonus. Everything is close to property and walk-able to restaurants& bars. We barely needed car, even though we rented one. Airport is just 10 minutes away. Overall we are very happy with the rental and recommend this rental for anyone looking to vacation in PR. Cheers! Loved the place, so close to the beach and pool and great views. lots of amenities and especially enjoyed the eggs and milk for next day breakfast and the complimentary rum and beer! Night of our arrival (sunday night) there was loud music at hotel next to ours (so loud it sounded like the music was in our condo with doors/windows closed. Music was from 6pm (when we arrived) until 10:30pm when we finally called along with others to complain. Fortunately, the rest of our stay the music wasn't playing but the first night made us concerned this was a nightly occurrence. If the music can be just turned down, I'm sure the guests would still be able to enjoy the music and not disturb others. Beautiful view, very clean and I love how they provided a few basic groceries!! They provided a crib and high chair for a very small fee which was very helpful. Seriously, look no further. Everything you need for a terrific stay is right here. 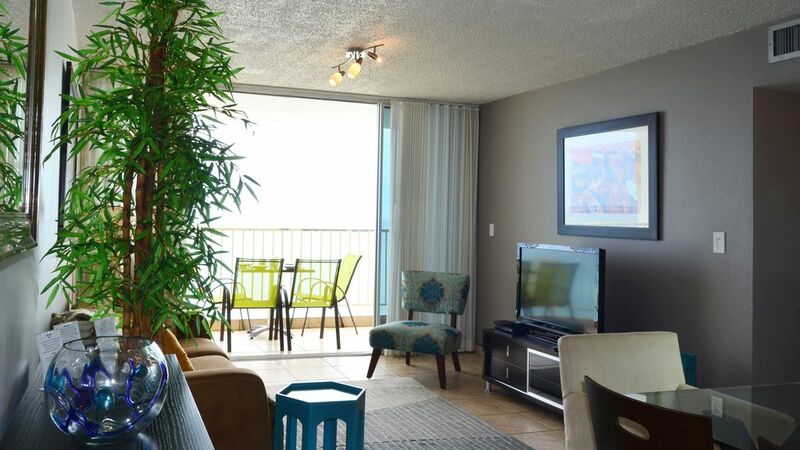 I stayed with my teen son in this awesome 2 bedroom condo in Isla Verde in July 2018. The communication with John, Annette and the rest of the team is terrific. Payments are easy. Arrival information is very detailed and they answered all of my questions promptly. As you can see, it's a high floor apartment with a peaceful view overlooking the beach. Easy, secure access out the back of the building to the beautiful pool and beach. We arrived to find the fridge filled with a feast of food (bread, turkey, cheese, bananas, coffee, milk, juice, beer, soda, rum, etc. to get us started). A wonderful arrival. No need to run out to the nearby supermarkets if you are tired from your trip but we did head less than 2 blocks to El Alambique Beach Front Bar and Grill to unwind and get situated. Plenty of other restaurants in walking distance--Metropol had a band the night we went and everyone was singing and dancing in the aisles. Wish I knew Spanish! We took Uber a few times to Old San Juan for visiting the forts and eating dinner. Note that you can't use Uber to or from the airport and the hosts provide names if you want to pre-arrange your airport transfer to the condo which is less than 10 minutes from the airport. There is also a taxi stand. We took a few day trips (via BeSpoke Lifestyle Management--search TripAdvisor) to the rain forest (Hector was the best guide ever--knowledgeable about rainforest life, politics, economics, history, food--we also hiked, swam, cliff jumped (just my son! ), rope swing and went down waterfall slides) and took a kayak tour through the mangroves to the bioluminescent bay in Fajardo (with a stop in between at the Loquillo kiosks for a meal) and a enjoyed a beautiful afternoon of swimming and snorkeling at Isla de Vieques. The shuttles picked us up right across the street at Walgreens. Super easy and convenient. If you'd rather just stay at your condo home for the week and enjoy the beautiful beach each day--there are also water activities right there on Isla Verde Beach. One thing you might want to be aware of is that there is a rooftop bar on the hotel next door and they do play music late certain nights of the week. We're night people so it was fine for us and the air conditioning dampens the sound. We had a terrific stay and highly recommend! We are flattered by your great review and are thrilled to read you enjoyed the great location of the unit and proximity to great places, while feeling secure at all times. We hope this is only the first of many stays! We will be looking forward to hosting you again anytime at Isla Bella! One of the most stunning views I've ever witnessed in recent years. Place is supper clean and welcoming. It was perfect to have simple sandwich makings waiting for me, after flying for 10 hours without food. There was also beverages (i.e., Coke and Coffee). Beds were comfortable, I melted right into the fluffy pillows, I love quality pillows. The security on the premisses, are very attentive, but I always felt safe, I walked the streets to the local bars, and restaurants at night, and was greeted by only friendly faces at every corner. I fell in love with PR. Can't wait to return. Only down side, is small. If you plan on watching TV in the living room, please read the information binder that's provided for you. Otherwise get out of the condo and enjoy the easy beach access, management provides beach towels, umbrellas, and balls. PR is too stunning to worry about that.